SmartSwitch by Husqvarna brings the convenience of one-touch starting, real-time feedback and “key-less” security to its line of riding mowers. SmartSwitch is a microprocessor enabled electronic interface designed for use with Husqvarna’s exclusive Endurance Series engines featuring ReadyStart® automatic choke systems. The feature will be available on select RZ series Zero Turn Mowers and GT series garden tractors initially. • Key-less operation – Along with the convenience of one touch starting, it also eliminates potential for lost keys or dead batteries when keys are left on (since the system automatically shuts down after a period of inactivity). • One-Touch Headlights that can also be programmed to shut off at pre-set times. • Safer Mowing in Reverse – One-touch activation allows mowing in reverse; and in case you forget, the system will shut off the cutting deck alone rather than the whole unit. A lit indicator clearly identifies status of the ROS (reverse operating system). • System Monitoring – A button showing current battery status will inform the user if the battery is below acceptable level or if the charging system is not functioning. It can also give multi-color indication of the current battery charge level. 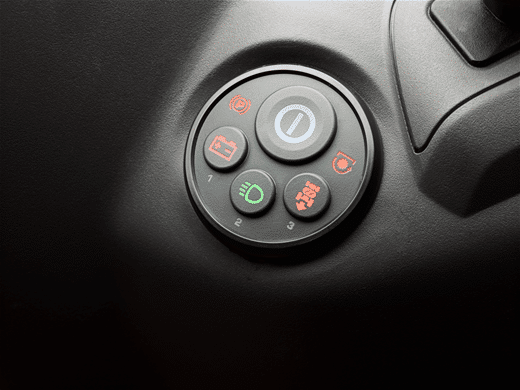 • Clear Feedback – The microprocessor controlled display indicates if the parking brake, cutting deck or steering levers need to be corrected prior to a start attempt. Products featuring Husqvarna SmartSwitch will be available in February 2014.